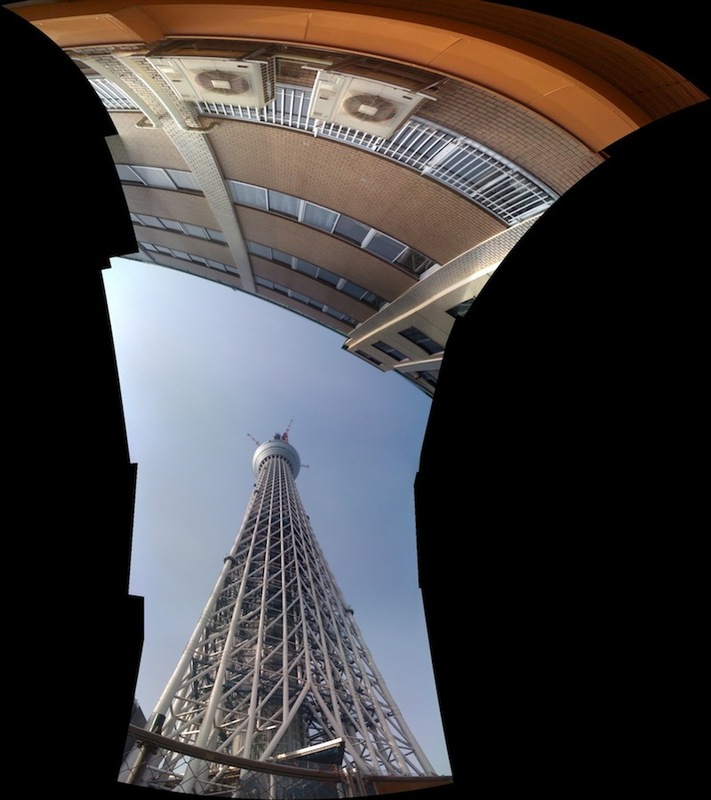 The other day I took my 8-year old son with me to Photo Gallery International in Tokyo’s Minato Ward to see Shintaro Sato’s new Tokyo Sky Tree work, Risen in the East, which is now showing until February 25. My son and I have had fun dabbling in creating panoramas with our respective iPhones — he “inherited” my old iPhone 3 when I upgraded to the iPhone 4 a year and half ago — and the great AutoStitch iOS app, so I thought seeing some physically printed panoramas might resonate with him, as well as the likely chance to meet Sato-san. Now this is a common and predictable reaction to seeing any work, I admit — it’s very rare for the real thing, as it were, to underwhelm the printed collection. But it did strike me that short of printing a book as a scroll or with pages that fold out, panoramas are at a particular disadvantage when it comes to conveying their message via more modestly-sized media like the photo book or an online gallery. There are only nine or ten pieces in the entire show, but most are large and three pieces take up an entire wall to themselves. While I’ve never really been a fan of the trend for large canvases, the sizes here felt right and especially with two different Tokyo cityscapes on view, provided an almost infinite series of details to pore over. (Sato-san told me some of these photos are composed from over 20 individual shots, stitched together using PTGui). One of these details, and you’ll find it in all the photos, is the Tokyo Sky Tree satellite tower, which is the ostensible “subject” of the work. I have to admit that a couple of years ago, when I saw Sato-san’s first attempts to negotiate the subject matter of Tokyo Sky Tree, I had my doubts about whether this work was the right sort of follow-up to Tokyo Twilight Zone. At that point the tower was in its nascent stages of construction, and the photos were, well, photos of its construction. Verbalized, I could understand Sato-san’s interest in documenting this new — and ambivalently welcomed — addition to his Tokyo cityscape, but visually it was not very interesting. All the more reason why I was so blown away by what I saw at the show. The difference between that early work and what Sato-san finally arrived at is that now there is a connection — a connection between this tower and the neighborhoods it looms over, and therefore a further connection between us as viewer and these photos. These photos really are not about the tower at all, I came to feel as I walked around the gallery, but about the cherry blossom viewing party, or Asakusa’s famed Sanja Festival, or kids playing soccer on a sandy pitch along the river on a Saturday afternoon. Whether obscured almost completely, as in the cherry blossom photo, or unmistakably centrally located as in the soccer photo, the Sky Tree isn’t the proverbial 900-pound godzilla in the room but simply a part of the landscape — a fait accompli if you will. One of the elements of Sato-san’s previous Tokyo Twilight Zone series that I really responded to was how the photos placed themselves on that borderline between grand city landscape and intimate neighborhood portrait. In Risen in the East, Sato-san has I think gone even further in the direction of the neighborhood portrait. Here the residents no longer have to be assumed — they are here playing soccer, partying in the park, setting lanterns into the river. 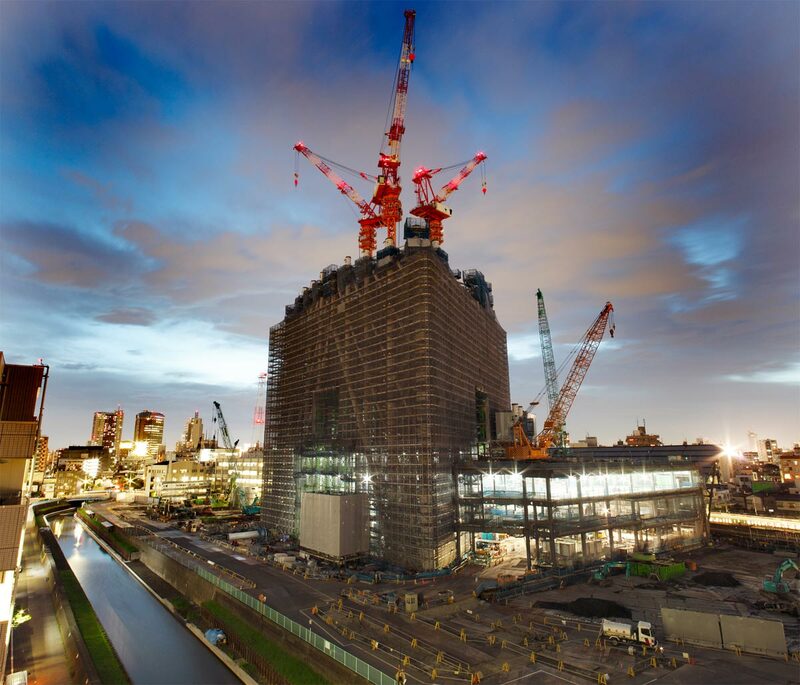 That Sato-san can achieve this, and still keep the 634-meter Tokyo Sky Tree in his sights, is not only a measure of his photographic achievement, but a larger statement that for better or worse, the tower is going to be with us for a long time to come. 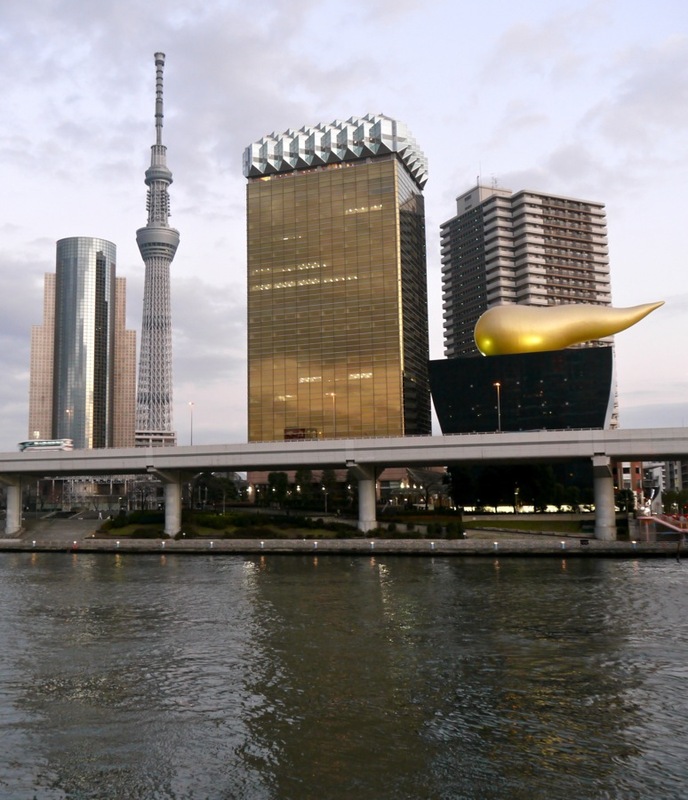 After the exhibition, my son and I caught the subway to Asakusa to have sushi at a place we like there, and after coming out of the station there was Tokyo Sky Tree towering above us, seemingly. Although I’ve of course been seeing the tower for a couple of years now, this was the first time to see in in a few months, and the first time to see it more or less finished (it opens next month). For me it still has that out-of-character-ness to it, something I’m not quite used to. I wonder when, or if, I will come to view it as just present rather than omnipresent, but then again Tokyo isn’t my city in anything close to the way it is for Sato-san and millions of people. I’m a weekend tourist, at best, and as such can afford to keep it at bay for a bit longer. My son of course, like most kids I suspect, is enamored of it. Shintaro Sato was born in 1969 in Tokyo, and graduated from Tokyo College of Photography in 1992 and Waseda University School of Letters Arts and Sciences in 1995. After working as a staff cameraman for Kyodo News for 7 years, he left there in 2001 and has been a freelance photographer since. 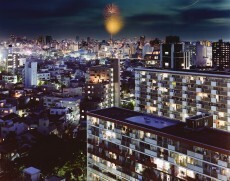 In 2008, Sato’s Tokyo Twilight Zone was published by Seigensha to great acclaim, and earlier this year Sato received the 2009 Newcomer’s Award from the Photographic Society of Japan. 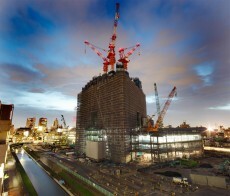 The above photo comes from Sato’s current work-in-progress, centering on the Tokyo Sky Tree broadcasting tower currently being built in Tokyo’s Sumida Ward. Please also see our Interview with Shintaro Sato. At first glance, the cityscape photos of Shintaro Sato seem to belong to that cliche of Tokyo as the hyperreal, super cool metropolis à la Blade Runner. Here is the great metropolis, tantalizingly beautiful in the twilight of the day, slowly succumbing to the neon-fueled incandescence of night. 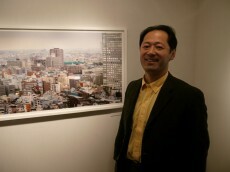 But to reduce Sato’s work to fulfilling this fantasy is a bit like not being able to see the city for the skyscrapers. What is remarkable about Sato’s cityscapes is not merely that they escape cliche, but that they do so while also confounding our expectations about cityscapes themselves. Sure the skylines are there, teeming against the backdrop of the sun’s aftermath or the occasional fireworks burst, but what makes his photographs so rich and inviting of repeated viewings is that Sato has deftly managed, from the various 10th floor fire escapes that serve as his observation deck, to hitch the grandeur of these distant vistas to the here and now of a lived, real city of parking lots, public housing complexes, cellular antennas, rooftop air ventilators, apartment buildings and single-family homes, to say nothing of the palpable if unseen presence of the millions that call Tokyo home. To paraphrase the famous tagline, there are 12 million stories in the city of Sato’s birth, and in Sato’s Tokyo Twilight Zone, we get to see a few of them. 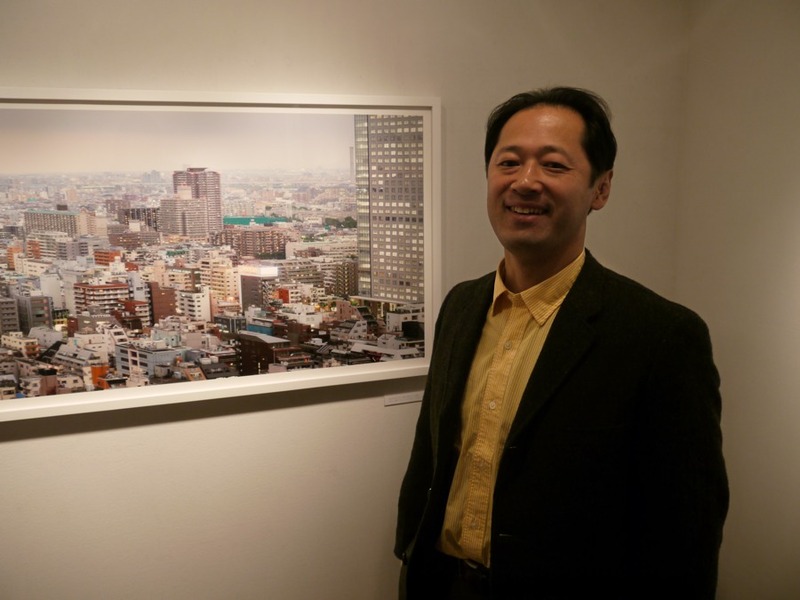 Japan Exposures is pleased to present the following extended interview with Sato, conducted earlier this year on the occasion of Sato being awarded the Newcomer’s Award from the Photographic Society of Japan. Sato talks to us about what it is that attracts him to photographing Tokyo, how he got started in photography, and the challenges of being a “house husband”, in addition to talking about his current work-in-progress revolving around the Tokyo Sky Tree broadcasting tower now being built. Please also see our Cover Photo from Sato, taken from his “Tokyo Sky Tree” series. 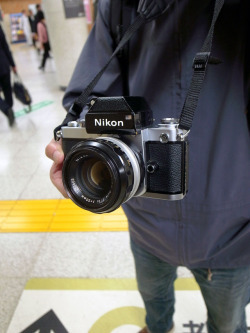 Japan Exposures: Can you talk about when you first became interested in photography. Shintaro Sato: In high school. I saw pictures by Keizo Kitajima in a magazine. At that time, I was not so fascinated with art, I was on the judo team, etc., but his photos were good. And after I graduated high school, I was fascinated with Shinya Fujiwara’s photos from India. Those two photographers fascinated me. JE: And so then after high school you went to…..
SS: Tokyo College of Photography. JE: Were you already shooting? SS: Of course I took some photos, but I only started shooting seriously after I entered school. I was there for three years. But my third year of photography school was also my first year at Waseda University. I wanted to study literature there. JE: How was the photography school important to you? SS: I got acquainted with many young photographers, many young students, which was inspiring for me. The way of looking at things was important, and I had some good teachers who taught me different ways to see things. It was at that time that I started to take pictures of the town. JE: So quite early you were interested in the city and cityscapes. JE: After graduating from Waseda, you went to work at Kyodo News. You worked there for 7 years, correct? SS: Yes. At first I worked with writers in the culture section, and so I would meet and shoot many artists, TV personalities, actresses, etc., that were being interviewed. It was good, but after four or five years, I got transferred to the news section. The job then became difficult. In the news section I took pictures of everything from baseball to accidents and murders. SS: Yes. I didn’t like news photography. It was hard work, and it took most of my time. I didn’t have any time leftover to focus on my own personal work. JE: Could you talk a little bit about your first book, Night Lights, which was published in 2000. 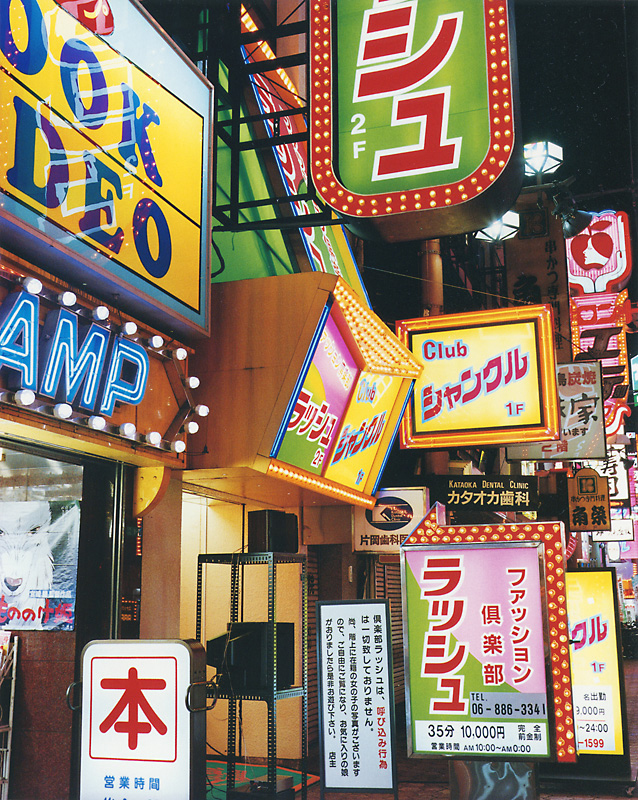 SS: I took the photos in adult entertainment districts in Osaka and Tokyo — kind of red light districts. When I first saw these densely populated areas, I thought that I had to take pictures there. 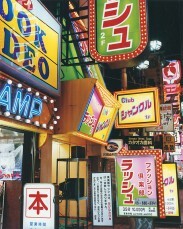 I was fascinated with this kind of area, and so I took pictures, especially of all these signboards. I like densely formatted photos, like those of William Klein, or Osamu Kanemura. Maybe these shops set out their signboards just for their practical need, and not for the beauty of them. But from my vantage point, these signboards created some beautiful rhythms and shapes. I think this unconscious or unintentional beauty is interesting. JE: How long are the exposures for these photos? JE: Why did you not want any people in the shot? SS: I wanted to show the thing itself. If people show up in the frame, the viewer sees people. Just the signs, just light, just colors, just the thing itself. And the rhythm these things were making. 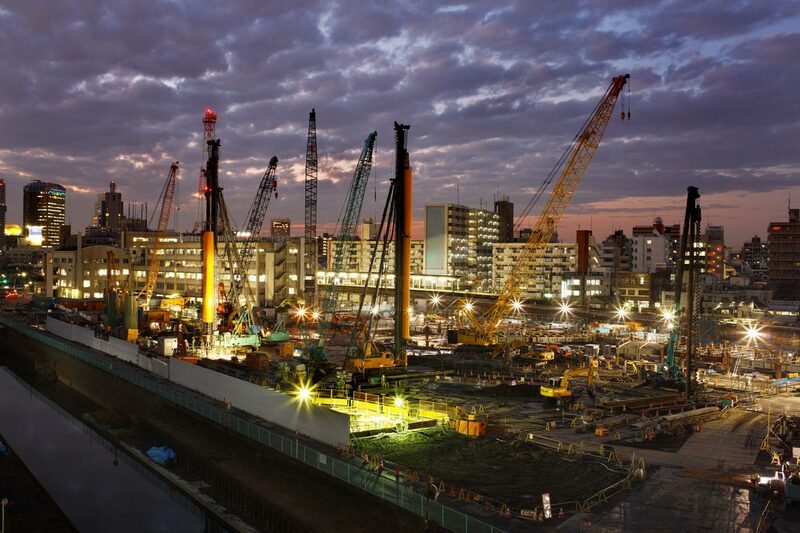 JE: This project was shot at night, of course, and Tokyo Twilight Zone was shot as the day turned into night. What attracts you about this time of day? SS: I’m fascinated with the colors and light at night. Also, I think in these pictures we can see everything, whereas in daytime maybe we cannot see like this. We can see dark and light at the same time. And color has more variety at night than in the daytime. For example, the sky appears red, dark places like the top of a building has a bluish color, the signboards are more vivid than in the daytime. And from the flow of light or the light coming from each of the windows, we can see signs of life more clearly than we can in the daytime, even though actual people cannot be seen in the photos. 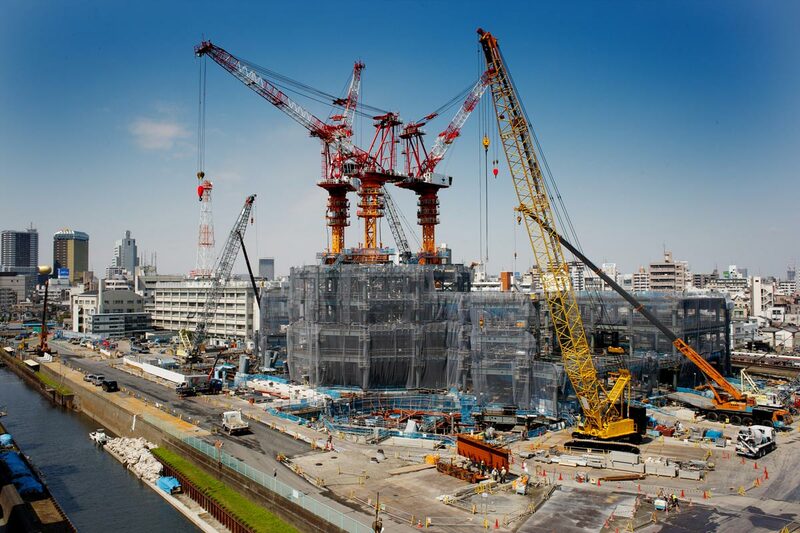 JE: Did this project lead into Tokyo Twilight Zone, or do you see them as separate projects? SS: While I was walking in these kind of narrow streets, sometimes I would wonder what it looked like from afar, and that led me toward the Tokyo Twilight Zone series. For me these two series have some continuity. Beauty in chaos, and unconscious beauty in Tokyo. JE: All the photos in Tokyo Twilight Zone have a same kind of perspective, for example the horizon line is usually in the same position. Did you decide on the general look of each shot very early on in the project? SS: Yes. I wanted to show density, but just density was not good enough for me. I needed to show space and color, like the blue sky, at the same time. As for the proportion of city and sky, I can’t remember why I chose it that way, but it just balanced best for me. 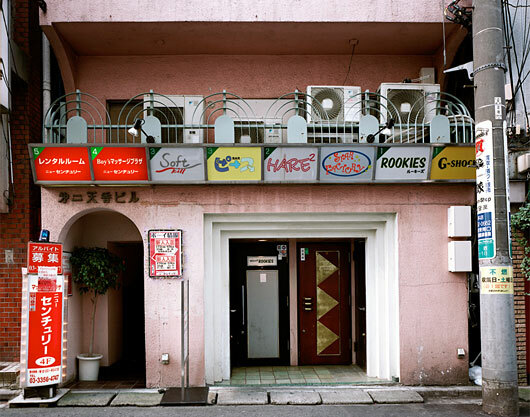 JE: The photos are not just cityscapes, but they also seem to be portraits of these different neighborhoods in Tokyo. Was that important? SS: Yes, very important. East Tokyo is important for me. I was born around this area — that’s one thing. Also, it’s not a very new place, like Shinjuku. In this area there are many old houses next to new high-rise buildings. That is chaos. But I feel a kind of power from this area, from this kind of disorder. This place has the unconscious power of chaos. In World War II, this area east of Tokyo was burned to ashes, and so after WWII, people remade their houses and their lives by necessity. That kind of historical power, that kind of unconscious power which is born from necessity and not from a sense of beauty, fascinates me. JE: What was the “hit rate” for Tokyo Twilight Zone? You take, say, 10 pictures — how many of them are as good as the ones in the book? SS: My success rate was not so low, because I am walking around during the daytime so many times, scouting locations, so when I take a picture, I know it’s a good location. I carry a map and notebook and mark down the place, the name of the building, the address. JE: For many shots, you have to go to the same building twice? SS: More than twice. Sometimes 10 times. This place [pointing to a photograph in Tokyo Twilight Zone], maybe I went to this place 20 times. Many many times, anyway. I like going to the same places. And sometimes I have to quit because of the strong wind. JE: You also mentioned that you only shot in 2 different seasons for this project? SS: December/January is the main season for me, and sometimes summer, for fireworks. The sky is very clear in December and January. JE: Is this project finished, now that you have published the book? SS: No, I will continue this project. 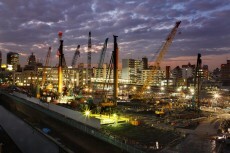 Even if I take pictures of the same place, I can still take photos that are different because Tokyo itself is changing. Maybe I will go somewhere in the future and see a tall highrise building built there. I want to take photos of that changing Tokyo. I want to continue until I’m dead, 20 years or so. Life is short. JE: But you’re still young? SS: No, no. I’m 40, so maybe 30 years or so left. It’s not such a long time. JE: The project is very multi-dimensional, isn’t it. It’s not just landscape. It’s almost like a portrait series, excepts it’s not a person, it’s the town. And the town, like a person, changes over time. So it’s like taking the same picture of a family, or the same people, over and over again, that makes it interesting. JE: You mentioned that in the Night Lights, you were not interested in people, just the signs. Here of course because of the distance there are no people per se. And your new project is also about building a new tower. Are you not interested in people? SS: No, no. I’m very interested in people, like this. [Points to a picture from his ongoing current project] I think this is interesting — many, many people gathering and making something. I think that’s interesting. So I make this kind of large close-up shot of all these people doing something. I’m taking those kinds of pictures. That’s what is interesting for me. JE: But generally, you’re not interested in portraits, or street photography. You’re more interested in shots from a tripod, or from a distant point. Why is that? SS: I like the paintings of Breughel. In those paintings, many people are doing something, but doing different things in one picture. We can see many different scenes in one picture. To get many different things in one shot, I have to view a place at a distance. So shooting from a distance is good for me. JE: You took the Tokyo Twilight Zone project with a 4×5 camera and on film. and the newer project on the Tokyo Sky Tree tower is mostly digital. 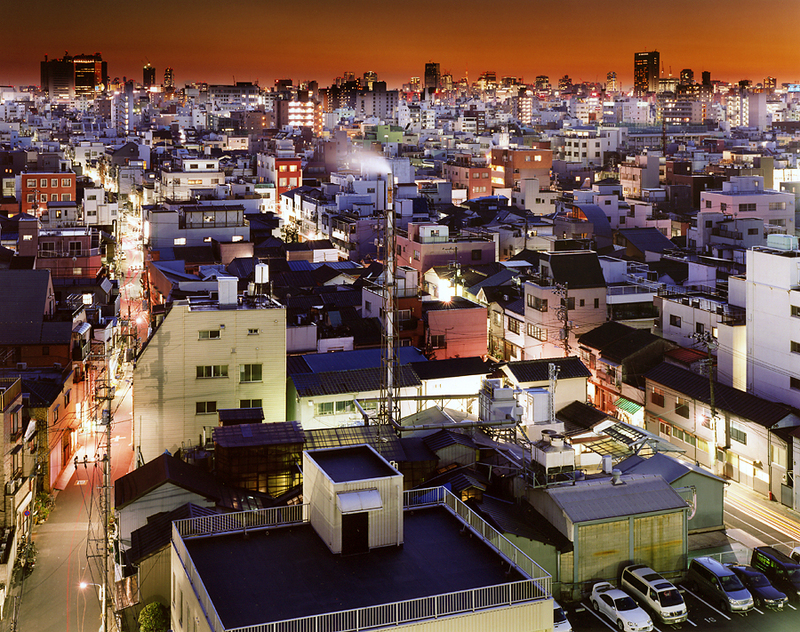 Why did you shoot the Tokyo Twilight Zone project with film? Why not even then use a digital camera? SS: Just a quality problem. Resolution, quality. I needed high resolution. If I could have used a digital camera equal to large format film, maybe I would have used that. JE: Why is high resolution important? SS: A desire for details. I want to see much more details in my picture. If possible, I want to be able to see the expressions on the faces of people who are standing in the distance, after enlarging the photo. You can sometimes see people in my picture, after enlarging. I want to show what kind of face, what kind of person is there. So high resolution is important. And if I make a very large picture, for example 1 meter wide on one side, you can see a man who is lying on his side in his room. I can see that in this picture. [points to a picture] With digital, I can get easier close up shot like enlarge, so I can get enlarge and enlarge, and I can see this person in large size. I like that. JE: Now with the new project, you feel it’s time to switch over to digital? SS: Yes. Not only is the camera quality good, but it is also better able to resist bad shooting conditions, so I don’t need to wait. If I wait until good shooting conditions come, like no wind, good weather, etc., the Tokyo Sky Tree tower continues to be built. So I need speed for this project. I need a camera I can use in bad conditions. JE: Can you talk about this new project, how it got started? SS: Yes. The advertising company Hakuhodo asked me to shoot the Tokyo Sky Tree for a big poster they wanted to do. At that time they were just doing foundation work, so I just shot the landscape of the building site. That was how it started. After that job was finished, I started to think that this new building was important, because it will change the landscape of East Tokyo. I was taking pictures of East Tokyo [for Twilight Zone], and this thing will change that landscape, so I thought that I have to take these pictures. JE: The angle, the proportion of the sky to the ground, is of course quite different from Twilight Zone. These are only three pictures, but is this the general angle, the balance of the foreground to background, etc.? SS: No, the tower will grow so high like this [gestures], so I have to change the proportion, according to the growth of the tower. I think that’s interesting, and that’s why I need a digital camera for this project, as it is very flexible. JE: How would you like your pictures to be seen as? As a record of what things looked like or how people lived at the time. What’s the sort of value to the next generation? SS: Mainly as a record of Tokyo. I think Tokyo is going to become more homogenized. 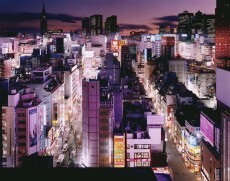 So photographs of Tokyo in these current times are important. I often take pictures of the eastern part of Tokyo because that place is not standardized yet. And every time I see Utagawa Hiroshige’s ukiyo-e prints of Edo-era Tokyo, I hope my photographs will be seen like his pictures. His pictures are a record of that time. JE: Do you have a specific audience in mind, or a particular purpose for your photos? SS: Of course to make a record of the town where I was born is important for me. That’s one thing. JE: Is there any critical judgment, either looking at the photo or looking at the location? SS: No, just some impact, just whether or not I can feel the power of the town. That’s my judgment. The town was made by necessity, and not by beauty, but from the fire escape I can feel the beauty and power of human beings who made the town. Whether something is beautiful or not beautiful is not important. Beauty is very complicated notion. I feel some place is beautiful where many people don’t and I feel another place is ugly where people think it’s beautiful. Beautiful is ugly and ugly is beautiful. To me Tokyo is beautiful, not ugly. I don’t really understand “ugly”. JE: When you say you don’t understand “ugly”, do you mean this scene, or in general? SS: Things are not so simple. I think I take pictures of places where you cannot just say “beautiful” or “ugly”. Things are more complicated than that. I like those place which you can say beautiful and at the same time ugly. JE: What do you think about people from overseas being interested in your work? SS: I’m glad of course, but I don’t have much opportunity to have conversations with people from other countries. I would like to ask, why are people outside of Japan interested in my work. Maybe in my work of Tokyo, there are some elements that they don’t have in their countries. Part of the reason is the charm of Tokyo — I think Tokyo fascinates people because it is beautiful and at the same time ugly. It cannot be understood by dualism like human life cannot be. My pictures show that aspect of Tokyo clearly. From Tokyo Sky Tree series. © Shintaro Sato. JE: What’s your main source of income? SS: Commercial work, and teaching school. Sometimes I do product photography, like taking pictures of clothes. And sometimes some magazines ask me to use my photos in their magazines, and they will give me some money. From that kind of thing. But mainly I’m a house husband. JE: How do you balance your own personal photography work with your family and your obligations as a father and husband. SS: I don’t do anything special. For example, I make my prints in my lab in my house. And during a break, I can cook, I can play with the kids, I can take my kids to the doctor. So I can balance my work with with my family. JE: It’s not so common in Japan where the wife works full time and the husband stays home. SS: Normally I feel nothing special about it, but when I go shopping in the daytime, I feel a little weird, self-conscious. SS: No. I show my parents my photos, so I think they think I make money. JE: Tell us more about your commercial work? SS: Well, the other day I took a picture for the cover of a Panasonic lighting catalog. Panasonic wanted me to take a picture of Tokyo at night. They wanted to use something new, rather than something from Tokyo Twilight Zone, so they asked me to take a photo in Shinjuku, with a row of normal houses in the foreground, and highrise buildings in the background. So I searched for a spot and found an apartment in Nakano [the neighboring ward to Shinjuku — ed.]. JE: Did you ask for permission? JE: Your Tokyo Twilight Zone book has been very successful. SS: Yes, now it’s running into a second printing, and I want maybe within a year for it to go into a third printing. JE: This year you were awarded the Newcomer’s Award from the Photographic Society of Japan. Do you think you are a newcomer? SS: Yes, in the photo world, anyone 40 or under is a newcomer. Of course I’m glad I received the award, because I thought I didn’t get it. I was just taking pictures because I thought I had to. That’s all. About getting a prize, I don’t have anything to do. It’s luck. Luck is important, so it’s hard to get. JE: What about other “newcomers” that you think are doing interesting work? SS: One photographer is Yuki Kanehira, who is taking photos of the Doujinkai apartments. He is kind of crazy, he is doing just that project. So until the last of Doujinkai apartments will be removed, he will continue shooting. He is a very weird person, but I want to introduce your readers to him. He is crazy.There is maybe just one more apartment left, and he lives there. He works very early in the morning distributing newspapers, to support himself. He is great, and I admire him. SS: They are not newcomers, but Mistugu Onishi, Naoya Hatakeyama, Koji Onaka, Kanemura — I love their photographs. I think they are all great. Onishi-sensei was one of my teachers at the photography school. He’s great. Shintaro Sato. Photo by Dirk Rösler. JE: Turning 40 this year, the “newcomer” — as a photographer, now is the big time ahead of you. Do you feel you are in a good position to go on to take photographs? Or do you feel too old? SS: I’m feeling that life is very short, that I’m a little old, and that there’s no time. In the long history of Tokyo, I can take pictures for a very short period like 30 years or so. And besides taking photographs, I have many things to do. Studying English is one of them — I’m studying English everyday. And I have so many books to read. I wish I were still 20 years old. We have signed copies of Tokyo Twilight Zone available through the Japan Exposures bookstore. On the weekend we visited Roonee photo gallery in Shinjuku where the closing exhibition of Shintaro Sato’s workshop was held. Over the course of ten weeks the participants got to grips with their loaned 4×5 cameras and worked towards this culminating show, which also included our current cover artist Igarashi-san. In the confined and atmospheric space of Roonee, each of the photographers introduced themselves and the work they had accomplished during the workshop and under the guidance of Sato. It was refreshing to see, hear and meet everyone and it confirmed my belief that every photographer can learn something by trying out another than their usual format once in a while, even if just temporarily, to keep things interesting and the mind open. Refreshing also to see the results of a 4×5 used on a monopod by a 35mm shooter, and also to see a female photographer using an LF camera (a real shame they are so rare). What makes practicing photography in Japan so exciting is that there is a very tangible photo culture and exceptionally large network of people out there who care as much about pictures as we all do even though the act of taking and producing pictures is often a solitary affair and one may tend to feel as if nobody shares your interest or passion for this activity (and don’t we all know the inquiring questions of strangers that we must either be a professional or a hobbyist, with little in between). So when a room of people looks intensely for a long time at photographs and talks about every picture in detail, even one you found initially not very interesting, then all the “disconnectivity” is forgotten – until next time, because there is a time when you need to be just by yourself. It is a balance between being together and being alone; only the right balance at the right time will help us moving forward. Takayuki Igarashi was born in 1977 in Yamagata prefecture, and currently lives in Tokyo. He graduated from Tokyo University of Science in 2004 with a Mathematics degree. Last year, he graduated from the School of Photograph | Picture | Image, which is part of Waseda University’s Art and Architecture School. The above image shot in Tokyo’s Shinjuku area — more from this series can be seen at Igarashi’s website — comes from a Shintaro Sato-led large format workshop that Igarashi took at the school last year. (Sato was previously featured last November on Japan Exposures). 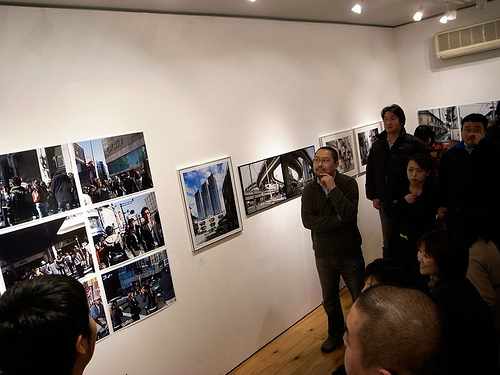 An exhibition of work done in the workshop, which was focused on capturing Tokyo, will be exhibited at Roonee Gallery in Tokyo from January 13 – 18, 2009.